If you’re considering adding a new porch, we know it can be difficult to envision what your home would look like with a room addition. You may find it difficult to envision how a porch would attach to your home so that it doesn’t look like a sore thumb. When these Leawood homeowners originally called us for a new screened porch, they probably would never have imagined that their porch addition would look like it was built with their home. At Archadeck of Kansas City, we know how important this is to homeowners. There are a couple important design techniques that ensure a room that’s added on looks original to the home. One of the first design considerations is the roofline of your new outdoor room. Often the new roofline will match the roofline of your existing home. If your home has a gable roof, we may also recommend a gable roof for your new room. Sometimes the roof shape will complement the existing roof shape or shapes. We take into consideration not only how the room will attach to the home but also whether the roof would obstruct the view from second-story rooms. Another important design technique when making a new room look original to the home is finding matching roof shingles. In the majority of the cases, matching products are available but there are a few cases where a match is not available. Looking at the picture above, you can see how the exterior of the porch is painted in a color identical to the home. The gutters and downspouts are painted to match. Even the style of the soffits matches the existing home. Let’s take a quick tour inside this new porch. The porch flooring is low-maintenance AZEK decking installed on an angle for visual appeal and a custom look. The focal point of this porch’s interior is an outdoor fireplace finished with a stacked stone facade. The fireplace hearth has a custom rounded design and is also finished with stacked stone. The porch’s screened openings are wide ensuring tremendous visibility out into the yard. The dark-colored slender profile railings are low-maintenance aluminum pickets. The slender profile and dark color draw the eye out into the yard. The ceiling has a great rustic feel with tongue & groove cedar finishing the interior ceiling. 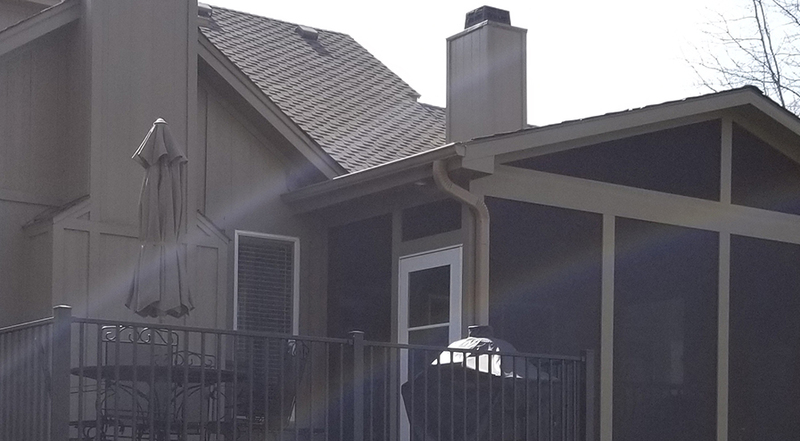 If you’re considering adding a new outdoor fireplace, screened porch or other outdoor living space to your Leawood or Kansas City home, give us a call for a free consultation at (913) 851-3325 or drop us an email. We look forward to your call.